Rebecca Kingston once felt safe in the belief she would live as her parents did. She’d get married, have children and enjoy a steady job, which in her case would be working as a Spanish teacher. She had been raised in a middle-class household. Her mother taught nursing at Asheville-Buncombe Technical Community College. Her father worked at the post office. They lived in a quiet subdivision in Weaverville. Instead, Kingston, now 38, found herself held back by mental health challenges and a relationship she said was abusive. Kingston dropped out of college at age 22 after suffering from depression and not seeking help. She did go on to eventually earn a bachelor’s degree in Spanish, but that took eight years. The marriage ended when she was forced to flee Florida with her 6-month-old daughter and return home to family in Western North Carolina. She had little money and no work. Kingston and the baby moved in with her parents, but she struggled to find a job. Kingston also couldn’t afford child care and said she spent more than a year on a waiting list for a government voucher that would allow her to reenter the labor force. A friend eventually found Kingston work with the Verner Center for Early Learning’s Early Head Start program, where she helped low-income Hispanic families needing preschool education for their children. Her daughter was able to enroll in the program and child care was no longer an issue. Kingston’s salary was low and she qualified for many of the same benefits as her clients. Wanting to leave her parents house and build a future for her daughter, Kingston found a mobile home in Oteen and moved her daughter there. It was far from the suburban life of her childhood dreams. There was broken glass on the grass outside and mice scurrying across the floor. 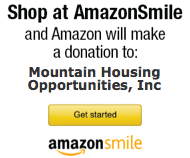 Kingston decided to apply for Mountain Housing Opportunities’ Self-Help program, where a neighborhood of families build low-cost homes together. Every weekend she joined others as they constructed their neighborhood. They worked through the seasons, framing houses in cold January and painting in the summer. Today Kingston has a 3-bedroom home with a subsidized mortgage and a low-interest rate. She also has a new job doing similar work for better pay at Community Action Opportunities. Her daughter, now 6, has a place to play outside. The family lives in a cul-de-sac with mountain views. Children play in the street. Inside the home, Kingston’s books lie next her daughter’s stuffed animals. The two decorated the interior together. There is no picket fence, but Kingston doesn’t care. As time has gone on, her dreams have changed. All she wants now is a safe upbringing for her daughter. “It’s incredibly important for everyone in our community to understand the toll that poverty can take on our quality of life and our relationships with our children — specifically how great of an impact our earliest experiences can have on every single aspect of our adult lives,” she said. To read this story on the Asheville Citizen Times site, please click here. To view the video, click here. Many people who live in poverty stay in poverty. Rebecca Kingston, of Weaverville, is trying to be an exception. The People and Poverty stories are part of a series on poverty in Western North Carolina. The work was done in partnership with the Marguerite Casey Foundation’s Equal Voice Journalism Fellowship.